With 12 members facing charges of corruption and bribery as a result of the Narada sting case, the All India Trinamool Congress (AITC) had decided to consult eminent legal experts to decide on what course of action ought to be taken. Sources say that the party has already approached Kapil Sibal, and an appeal to withdraw the FIR filed by the CBI against the 12 leaders will be filed soon. However, CBI sources said that FIRs against 15 more AITC leaders will be filed next week and that the interrogation process will begin this week itself. On 17 April, the CBI lodged FIR against 12 AITC leaders in connection with the Narada sting operation case in compliance with the Calcutta High Court order of 17 March. It includes six AITC MP’s and four ministers of Banerjee’s Cabinet. The 12 leaders, who include Rajya Sabha MP Mukul Roy, Lok Sabha MPs Saugata Roy, Aparupa Poddar, Sultan Ahmed, Prasun Banerjee and Kakoli Ghosh Dastidar, were seen receiving cash from a representative of Naradanews.com, which conducted a sting operation in 2014 but released the footage only in 2016 ahead of the assembly election in West Bengal. West Bengal Chief Minister and party supremo Mamata Banerjee has called the whole affair a “conspiracy”. Trinamool sources claim that Banerjee is also making an attempt to consolidate non-BJP parties to build a joint forum to fight the BJP. As part of the strategy, AITC has decided to lodge FIRs against BJP leaders accused of murdering local AITC panchyat leader Dulal Biswas at Bagula Bazzar in Nadia on 16 April. Biswas, who was shot multiple times inside the party office, allegedly by killers hired by the BJP, is the first casualty in the escalating war between the two parties. 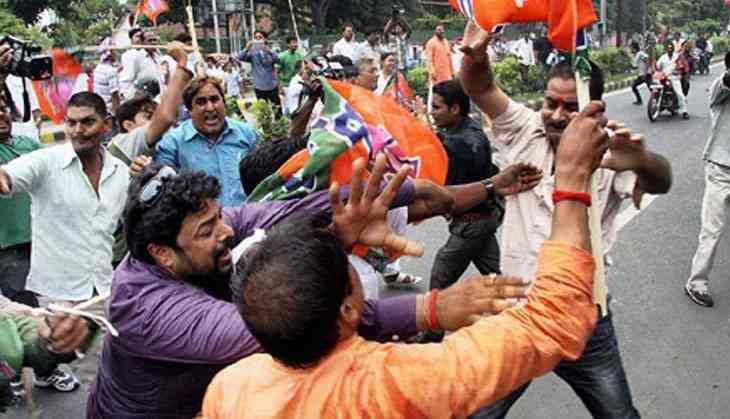 Frequent clashes between the workers of the two parties have been on the rise. Recent incidents include clashes at Parui in Birbhum and Keshari in West Midnapore. The state police have detained four BJP leaders at Nadia in connection with Biswas’s murder. Babul Supriyo, BJP MP and MOS for Heavy Industries and Public Enterprises says AITC leaders are only saying that the FIRs against its leaders are an act of “political vindictiveness” because they are scared. “They are consulting legal experts to resolve the case This is simple dichotomy and they are trying to mislead the people,” he says.